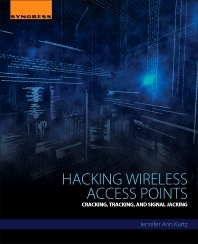 Hacking Wireless Access Points: Cracking, Tracking, and Signal Jacking provides readers with a deeper understanding of the hacking threats that exist with mobile phones, laptops, routers, and navigation systems. In addition, applications for Bluetooth and near field communication (NFC) technology continue to multiply, with athletic shoes, heart rate monitors, fitness sensors, cameras, printers, headsets, fitness trackers, household appliances, and the number and types of wireless devices all continuing to increase dramatically. The book demonstrates a variety of ways that these vulnerabilities can be—and have been—exploited, and how the unfortunate consequences of such exploitations can be mitigated through the responsible use of technology. Jennifer Kurtz is a technology project manager, business development consultant, educator, and writer, currently focused on information security, privacy, organizational resilience, and marketing strategy. She has held appointments at Purdue University and Ball State University and currently teaches and develops graduate courses in information assurance at Regis University. Her work in telecommunications includes leading statewide broadband infrastructure and eGovernment initiatives as Indiana’s director of eCommerce, building and managing the telecommunications infrastructure for Delco Remy International, and co-authoring a 10-year strategic plan for the US Department of the Treasury. She wrote the chapter on data leakage prevention for the American Bar Association's 2011 best-selling book, The Data Breach and Encryption Handbook, in addition to other publications and information assurance blogs. Her degrees are from The American University and Anderson University.